Material selection is an important driver for the success and longevity of the kiln. The following materials were used in the kiln construction. The costs have been included but this will vary based on location, quantities, time (fall 2014) and distributor. The European 3″ brick style was used instead of the 2.5″ that is more common in the US. The reason is that the 9″ x 4.5″ x 3″ dimension is significantly more versatile given the divisibility of both 4.5 and 3 into 9. Given the weight of the materials (~10,000 lbs) a 14′ Uhaul truck was rented and two trips made. After unloading both loads by hand, it was the next day before any work started! While not addressed herein, material safety is critical when handling many of these products. Refer to the safety page for more information although this page is not meant to replace reading and following MSDS instructions nor should it be construed as exhaustive or complete! Insulating Firebrick (IFB) – Greentherm 2300 LI – This 51% Alumina brick was selected due to its ability to withstand up to 2300F and its insulating characteristics (0.24 W/mC @ 1000F). Another great characteristic of this brick is its machinability. An old handsaw was used to cut the bricks where needed and cut like a hot knife through butter. Additionally, at 2.5 lbs per brick they handle easily. They are packaged in ten bricks per box and cost on the order of $35 per box. Super Duty Firebrick (SDFB) – KX-99 – This 42.2% alumina brick was chosen as the hot face brick for the kiln based on its excellent alkali resistance (the primary issue with wood fire). At 10 lbs per brick they aren’t the easiest to toss around but they’ll last for the long haul. At around $5.30 per brick plus $1.09 per brick for shipping these were the most expensive part of the kiln. Since these bricks are so dense and therefore very difficult to cut, bats were also ordered. Bats are half-bricks at 4.5″ x 4.5″ x 3″. The bats were the same cost as the whole bricks. High Duty Firebrick (HHFB) – Empire-S – This 36% alumina brick was chosen as a lower cost alternative to the SDFB for the chimney, after the first 7 layers. Because the chimney sees somewhat lower temperatures above the very bottom this brick was chosen to save cost. 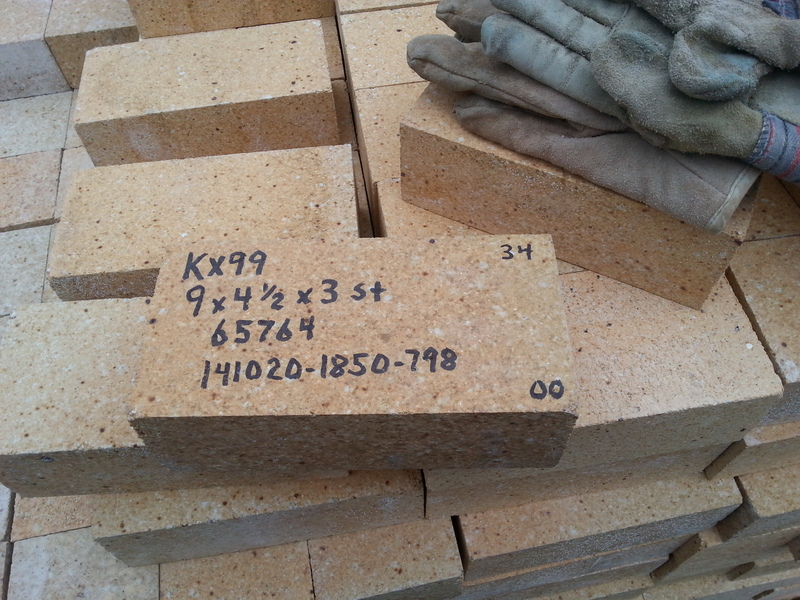 The cost is on the order of $3.50 per brick but since each brick weighs about 9.4 lbs the shipping costs can be high. From Illinois to Toledo, $1.13 per brick was the cost. INSBOARD – INSBOARD 2300 HD – This Alumina (43%)/Silica (55%) product is usable up to 2300F and was selected for its insulation characteristics (better than IFB, 0.12W/mC @ 1000F) to retain heat above the firebox and the chamber above the castable refractory in both cases. The product comes in sizes 24″ x 36″ x 1″ in quantities of 8 per box for on the order of $550 per box. I only required 6 pieces but stacked the extra two on top of the firebox. The product also comes in 2″ thickness. Cerablanket – An 8lb densiry product at 24″ wide and 2″ thick. this comes in rolls that are 12.5′ long and cuts quite easily with a utility knife. It does not compress much ender lite loads. the entire roll was on the order of $200. Hobs – These ceramic pieces are 3″ in diameter with a 1″ diameter hole, 23″ long. They are sold as kiln posts and have been used as hobs by others in wood kilns although it is unclear what the material is except that it is rated for heavy use at cone 10 . As a safety measure, a 7/8″ diameter steel rod is inserted into the hole inside each hob. In the event that the ceramic cracks we can at least limp through to the end of the firing and replace it for next time. Kiln Shelves – Oxide Bonded Silicon Carbide is the traditional shelf material used in wood kilns. There are nitride bonded varieties that are cheaper but won’t hold up as well due to the atmosphere in the kiln. 12″ x 24″ x 3/4″ shelves were used and cost on the order of $115 per shelf including shipping. Castable Refractory – Mizzou Castable Plus – This is a 3000F, 60.6% alumina, refractory cement that comes in 55lb bags at the rate of $40 per bag. Given the material required (140 lbs/cu.ft. ), 13 bags were necessary. INSBLOK – INSBLOCK-19 (TR-19) – This is a mineral fiber board with mineral additives board that comes in 12″ x 36″ x 1″ pieces and is good to 1900F but not to be used in direct contact with flames. It has a relatively low compressive strength (38 lb/sq.in.) so it was selected as a base of the kiln installed on top of the cinder blocks so that any uneven corners of the cinder blocks would compress the board and yield a level surface. Although only 13 pieces were needed, the product comes in 16 pieces per box and was on the order of $140 for the box.